After reading some Maigret in December, I decided that classic noirs and old police procedurals are totally worth returning to at regular intervals. And It was waaay too long since I’d read a Martin Beck police mystery. Fall of 2017, to be exact (thank you, blog archives!). So as soon as 2019 rolled in, I reconnected with the Swedish police force, and it was as if not a day had passed since I’d left them. Beck is still at odds with his wife (and brother-in-law). Kollberg is still his grumpy old self. Melander is brilliant but boring. Gunvald Larsson is an unlikely hero. And there’s a newbie, a rookie policeman who is hilariously ambitious and clumsy (a dangerous combination). I had forgotten how funny these books are. I mean, seriously laugh out loud funny, with just a few words for a full effect. People are so real, in their petty concerns, wishing for the weekend, hating the cold weather, bad-mouthing the colleagues… By any standards people are not very expansive and prone to emotional outpours but it delivers a punch. They do have a life beside the office, and in part because of that, and also because life is complicated, investigations often progress at snail pace, which is way more realistic than the 50 minutes open-and-shut cases of SVU and CSI. These books are not for hurried readers who want cheap thrill and twists in each page, but if you’re good with that, it is a real treat. 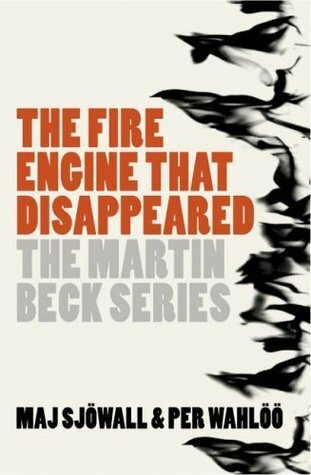 The fire engine that disappeared is a tongue-in-cheek title, because the story starts with an explosion, that could be arson, or murder, or suicide, or plain accident, and it takes a long time to settle between these possibilities. The fire engine that would have extinguished the fire took a very long time coming (yes, things don’t run as smoothly in Stockholm as the ideal country of hygge would have us think). There actually is a toy fire engine that gets lost in the story too, and this mystery too gets resolved in the end.